VOX - The user's voice is detected and the radio transmits without the need to press any buttons, freeing hands for other tasks. 5 VOX sensitivity levels allow the user to select at which point the radio will detect their voice. Cobra~ Walkie- microTalk CXR925 35-Mile 22-Channel Two-Way Radio~No Charger . Used & untested. Includes battery with unknown condition. Tested works good. Does not include charging base. Batteries not included, requires 3 AAs for each walkie talkie. The radio will emit a tone when weather alert signals are received. 2662 Channel Combinations: Available when the 22 channels are combined with the 142 privacy codes (38 CTCSS/104 DCS), these combinations prevent interference from other radios. For sale from Estate Sale: One (1) Cobra MicroTalk PR-240 Two-Way Radio. See pictures.What you see is what you get! Waterproof spec allows you to be ready for whatever mother nature can throw at you. A total of 3124 channel combinations are available when the 22 channels are combined with the 142 privacy codes (38 CTCSS/104 DCS). Pair Of Cobra MicroTalk FRS-100 Walkie Talkie Family 2Way Radios Sealed in package Condition is Quality Remanufactured Product Shipped with USPS Priority Mail. 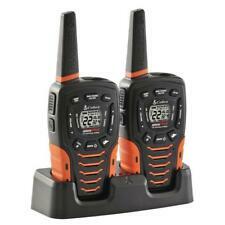 These are the Cobra Model GMRS-935 Micro Talk 2 way radios. 22 Channels. Full Channel / CTCSS Scan. The application is in the user manual. Takes 4 AAA batteries (not included). Up to 5 mile range. Illuminated LCD. COBRA CXT237 MicroTalk 20 Mile FRS/GMRS 22 Ch Walkie Talkie 2-Way Radios 4 Total. Condition is Used. Shipped with USPS Priority Mail. All 4 work great . All come with batteries and chargers . Stay connected to your partner with these Cobra Cxt195 Walkie Talkies. These 2-way radios walkie talkies have a Roger beep confirmation tone that indicates to others when it's clear to talk. The power-saver circuitry extends the battery life when not in use. Always stay in touch with your family and friends during outdoor activities with the Cobra CXT145 2-Way Radios Walkie Talkies. The Cobra CXT145 utilizes UHF/FM technology for ultra-clear long distance reception. Up to 5km range. Unique circuit extends battery life when not transmitting or receiving. Power saver circuitry. Battery Saver Circuitry. Compact design with extended range. Battery Low Indicator. Keystroke Tone Signal. Cobra MicroTALK Two Way Radio FRS 130 Walkie Talkie. Fully Tested with 4 AAA Batteries and Works Great. This also applies to combined orders. Cobra ACXT545 Walkie Talkie 28-Mile Range NOAA Weather Channels 30 Mile Range. Cobra MicroTalk FRS 220-2 CH VP 2-way radios. Up to 2 mile range. Water Resistant. Factory Manual. 38 Sub-Channels. You'll never lose touch again. Cobra's microTalkÂ® 2-way radio pair features both FRS and GMRS channels, all with easy access from the front panel push buttons. 38 privacy codes keep your conversations secure. This radio set is in good condition with minor wear (see pictures). These radios have been tested and work perfectly. COBRA PR 240 MICROTALK 2-WAY RADIO. SET OF 2 - FULLY TESTED. Minor surface marks from normal use. Weather Radio. 22 Channels. Battery Saving Technology. Call Alert. Front panel push buttons provide easy access to all 22 channels (7 GMRS/FRS, 7 FRS, 8 GMRS). Automatically switches to battery mode if there are no transmissions within 10 seconds. Fair Pricing. 100% Original. Here is apair of COBRA CXT235 MicroTalk 20 Mile 22 Channel Walkie Talkie 2-Way Radios. Features: Extended range capability provides up to 20 mile range. (Range will vary depending on terrain and conditions.). Cobra CXT195 2-Pack 2-Way / Weather Radio Walkie Talkies 16 Mile Range NEW !! 4 out of 5 stars - Cobra CXT195 2-Pack 2-Way / Weather Radio Walkie Talkies 16 Mile Range NEW !! 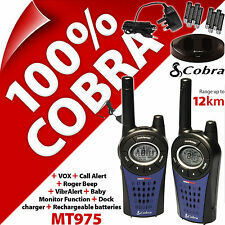 18 product ratings18 product ratings - Cobra CXT195 2-Pack 2-Way / Weather Radio Walkie Talkies 16 Mile Range NEW !! How far can I expect my 2-way radios to communicate?. The communication range quoted is calculated under optimum conditions, with an unobstructed line of sight. Actual range will vary depending on terrain and conditions, and is often less than the maximum possible. Huge Lot of 15 Cobra Microtalk 1 walkie talkies. All have been tested with batteries to power on. These are being sold as is in their present condition. If you see it pictured, it is included. If you do not see it pictured, it is not included. UHF PMR446. This Floating waterproof radio allows you to be ready, whatever the weather. Up to 968 channel combinations are available when the 8 channels are combined with the 121 privacy codes. Voice Encryption fitted. The applications of the Cobra MT975 are countless. UHF PMR446. Voice Encryption fitted Trunking Facility 8 Security Tones. Construction Industry. Security Guards. Country Houses. The AM1035 in the 'Adventure' series of Cobra Walkie Talkies is the most powerful model and is floatable. It is suitable for outdoor activities such as Sailing, Hiking, Camping, Jogging but also during group activities and work related projects.